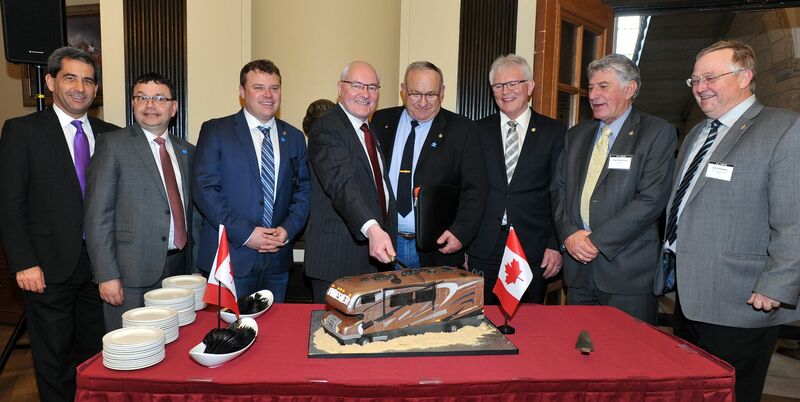 The Recreation Vehicle Dealers’ Association of Canada (RVDA) and Canadian Campground and RV Council (CCRVC) hosted a joint advocacy push on Parliament Hill from April 25-26th 2018. On April 25th members of both associations gathered for a reception Commonwealth Room that was attended by a record 50 MPs and Senators from all parties, in addition to a number of parliamentary staff. The reception gave RVDA and CCRVC representatives an opportunity to informally discuss issues related to the RV and camping industries in Canada, while enjoying some Ottawa hospitality and getting a first hand sense of a busy evening of parliamentary proceedings. The group began its meetings on Parliament Hill on April 26th with a breakfast hosted by Alaina Lockhart, Parliamentary Secretary for Small Business and Tourism. Lockhart, who has a CCRVC member in her riding, spoke about the actions that the government has taken to encourage tourism and support small businesses. This conversation served as an excellent start to a full day of meetings. The RV and camping industry was featured prominently in the House of Commons during the day. During question period, Banff-Airdrie MP Blake Richards asked the Minister of National Revenue about the need to ensure that campgrounds have access to small business tax rate, highlighting the actions of RVDA and CCRVC delegates in Ottawa. RVDA and CCRVC also participated in a press conference in the Charles Lynch Room, highlighting messaging on the need for tax fairness as well as for increased investment in federal campgrounds. The news release led to media stories in British Columbia and Prince Edward Island. In total 48 meetings were held with MPs, Senators and Officials. Representatives were able to secure a number of commitments from legislators that will help to encourage investments and regulatory changes to assist Canada’s RV industry over the years to come. The Canadian Camping and RV Council (CCRVC) is a national, volunteer federation of the Provincial Private Campground Owner Associations and their members. CCRVC was incorporated in 2013 by the RVDA of Canada and the Canadian Recreational Vehicle Association with a mandate to provide for the betterment and to support the Canadian RVing and Camping Industry in Canada. ell as for increased investment in federal campgrounds. The news release led to media stories in British Columbia and Prince Edward Island. Canada’s RV and Camping Industry includes 2347 Private Campgrounds, 450 RVDA Dealers and CRVA Manufacturers who collectively employ 60,000 Canadians and contribute over $14.7 billion to Canada’s GDP. In 2016, over 5.8 million Canadians or 22% of the adult population engaged in camping activities coast-to-coast. Our Private Campgrounds offer an opportunity for middle-class families to spend time together, create life-long memories and discover Canada’s natural landscape. Camping is an affordable activity for the Middle Class and creates a strong sense of community that is unique to this form of travel accommodation across Canada. CCRVC strongly advocates that the Government of Canada recognize the income earned by campgrounds as “active business income” for the purpose of determining eligibility for the small business deduction. Private Campgrounds throughout Canada have been asking the Federal Government, specifically the Minister of Finance, to endorse changes in the current Income Tax Act that clearly distinguishes family run campgrounds with less than 5 full time employees as an “active business” and thus eligible for the small business tax deduction. The potential classification of a Campground being assessed as a “Specified Investment Business” is ambiguous and up to determination by the Canada Revenue Agency remains the #1 threat to not only Private Campgrounds but to all RV and Camping Industry Stakeholders. During a compliance test conducted in 2015 by the Canada Revenue Agency, 3000 Small Businesses were audited by the CRA. Out of the 3000, 70 were Private Campgrounds and of the number 10 were denied the SBD and re-assessed at a 300% tax rate increase, some retroactively 2-3 years. This threat is preventing campgrounds from increasing investment and improvements in their business and stifled additional seasonal hiring due to monetary concerns. We conducted a survey of our 2347 Private Campgrounds in March of 2018 and the issue is still their # 1 concern. Given this, we hereby ask for your support with the Minister of Finance to enact a clear change in the classification of small private campgrounds. CCRVC supports the need for increased investment in Canada’s tourism marketing strategies by Destination Canada to support the RV and Campground Industry. CCRVC was pleased with increased expenditures to Destination Canada from the Federal Government in the past (2) Federal Budgets to encourage Canada as a travel destination. We believe that Private Campgrounds have benefited along with our Hotels in the growth of Canada’s Tourism sector. We encourage Destination Canada’s advertising and messaging to include more references towards RV and Camping opportunities in their programs. The Canadian Camping and RV Council (CCRVC) is a not-for profit federal body that consists of Provincial Campground Associations, the Recreational Vehicle Dealers Association of Canada and the Canadian Recreational Vehicle Association (Manufacturers and Suppliers). The Canadian Camping and RV Council has come together to create this initiative to bring the issue of Tax Fairness for Small Campgrounds to the attention of the Canadian public. It is our mission to restore small campgrounds classification as a small business, so that camping can continue to be a pastime that generates sustainable tourism revenue and growth for rural and northern communities for years to come.